Please note that our classes are non-refundable unless your seat can be sold before the class takes place. For the comfort of others we ask that attendees refrain from wearing perfume or other scented products during classes. All classes start at 10:15 AM. Unless otherwise stated. Please arrive between 10 and 10:15. Note that the store will no longer open before 10. Come Join us any Monday or Friday for open sewing. We are here to help. Space is limited so please call us and reserve your spot. 231-271-0117 $5.00 for all day. Sherry Sienkiewicz will be presenting how to square up your quilt and attach the binding and get it ready for long arm quilting. Take your piecing to the next level. Sherry will be teaching pressing techniques, perfecting 1/4" seam allowances and making perfect points. Thursday, May 9th from 10:15am-4:00pm. 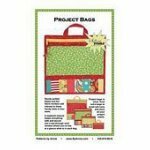 Join Renee' and learn construct of a very simple project bag. Monday, May 13th from 10:15am -4:00pm. In our Paper Piecing class you will make an easy Throw. Tuesday, May 14th, 10-4pm. 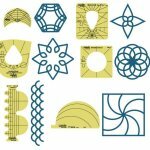 If you are a perfectionist when it comes to the quilting part of your quilt Westalee Template Ruler work is for you. With a little practice you can master the fasting growing method to quilt. Join Sherry and learn the art of Hand Applique. You will be learning the basics of tracing, placement and several basic stitches. Pattern is included in the class fee, "Vine and Berries", by Edyta Sitar. This is a 2 session Class beginning Thursday, May 16th and 23rd, from 10:15am-1pm. Come Join our Loyal Union Group the Third Monday of every month! Along with learning the CutRite Clamshell piecing technique Color Theory will be discussed. Diane Speas will be teaching the art of taking fabric, wrapping it around stiff cardboard to create a beautiful box. There are several different boxes to chose from. Class Monday, April 8th from 10:15am -4pm OR Monday, June 10th from 10:15am-4pm. Come to Premier Night for the beginning of our Shop Hop, June 19th from 5pm-8pm and receive a special gift and enter our drawing for $100 gift certificate. Shop Hop ticket will be available for purchase May 1st for $10.00 so stop by so that you can participate in all the sales, drawing, and fun. Come join the fun of traveling around to 5 different area shops. Our theme this year is Desserts and a special kit will created and available for purchase. There will be sales, fun and chances to win our $200 dollar gift basket. So don't miss out! This 12 month block of the month begins in March. You will receive a total of 24 7/8 yards of Marcus Bros fabric to complete the full quilt including the binding, backing ad batting. Plus the Mrs. Miller's Apprentice pattern in 12 parts by Pam Buda. Optional at no additional cost is offered 12 classes to guide you. Enrollment limited. Call today for details.